We’ve analyzed Earthborn and graded it according to the We’re All About Cats standard, evaluating the brand on species-appropriateness, ingredient quality, product variety, price, customer experience, and recall history. Here’s how it rates in each of these six key areas. We give Earthborn cat food a 43 out of 60 rating or a B grade. Earthborn Holistic is owned by Midwestern Pet Foods, a US-based company that began as a milling operation in 1926 and, according to Petful, started making pet food in the 1940s. Midwestern Pet Foods is now in its fourth generation of family ownership and operates as a subsidiary of Nunn Milling Company Inc. In addition to Earthborn Holistic, the company owns and manufactures several pet food brands including Pro Pac, Sportmix, and Wholesomes. Earthborn cat food is primarily made from US-sourced ingredients. Exceptions to this rule include lamb meal from Australia or New Zealand, flaxseed grown in Canada, and potentially, some vitamins, minerals, or amino acids from China. Earthborn Holistic dry foods are made in company-owned facilities in the United States. Midwestern Pet Foods owns and operates facilities in Illinois, Indiana, Oklahoma, and New York. These manufacturing facilities are approved for sales to the European Union, Russia, Israel, Australia, and other countries with stringent import regulations. They’re HACCP approved and FDA-inspected. Earthborn Holistic’s wet food manufacturing is outsourced to US Pet Nutrition, a subsidiary of the Thai Union Group. Has Earthborn cat food been recalled? There’s no indication that Earthborn Holistic cat food has ever been recalled and, according to the company’s website, neither has any other Midwestern Pet Foods brand. 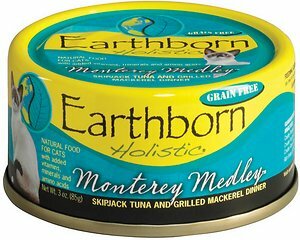 What kinds of cat food does Earthborn offer? The Earthborn Holistic cat food lineup includes both wet and dry food. Their dry food selection is limited to three products. All but Feline Vantage™ are grain-free. The brand’s wet cat food selection is larger, including a variety of grain-free foods in cans or pouches. Their meat-first recipes are made without corn, soy, wheat, or animal by-products. They’re free of artificial colors, flavors, and preservatives. This popular food is straightforward and simple. With the exception of Chicken Catcciatori’s potato content, it follows the same recipe blueprint used by brands like Weruva and Tiki Cat. Chicken broth is the first ingredient, followed by shredded chicken meat. The third ingredient is potato, which increases the food’s carbohydrate content without adding significant nutritional value. The food contains sunflower oil as its primary fat source. While it’s not harmful to cats, sunflower oil and other plant-sourced fats aren’t optimal for obligate carnivores. We’d rather see animal-sourced fats on the ingredient list. The food is thickened with guar gum. While guar gum isn’t an essential ingredient in cat food and is certainly not species-appropriate, it doesn’t appear to be harmful. After the primary ingredients, the recipe includes a variety of essential vitamins, minerals, and amino acids. 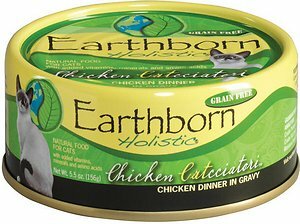 Overall, Earthborn Holistic Chicken Catcciatori is a meat-based food with high protein, low fat, and moderate carbohydrate content. It has 70 calories in each 3-ounce can or 23 calories per ounce. Chicken Broth, Chicken, Potatoes, Sunflower Oil, Natural Flavors, Tricalcium Phosphate, Guar Gum, Salt, Potassium, Chloride, Taurine, Choline Chloride, Magnesium Sulfate, Iron Proteinate, Zinc Proteinate, Niacin, Vitamin E Supplement, Thiamine Mononitrate, Vitamin B12 Supplement, Manganese Proteinate, Copper Proteinate, Vitamin A Supplement, Calcium Pantothenate, Riboflavin Supplement, Pyridoxine Hydrochloride, Biotin, Sodium Selenite, Vitamin D3 Supplement, Folic Acid, Potassium Iodide. Skipjack tuna appears to be the primary protein source in this wet cat food. This canned food consists of chunky, flaky fish in a thickened fish broth. Fish broth is the first ingredient, followed by skipjack tuna. This species is relatively small and is the variety you’ll find in the average can of tuna for people. Skipjack is followed by mackerel, a name applied to over 30 species of ocean fish. Though various fish species share the name, all mackerel have shared characteristics. As food, they’re quite oily and rich in omega-3 fatty acids. Potatoes appear as the fourth ingredient. Cats don’t naturally eat plants and high-glycemic vegetables like potatoes are a particularly species-inappropriate option. The food contains sunflower oil as a fat source. Ideally, animal fat sources would predominate over plant-derived fats. It’s stabilized with guar gum, a natural thickener. Like potatoes and sunflower oil, guar gum isn’t species-appropriate, but it’s also not necessarily harmful. The food contains a trace amount of “natural flavors”, an additive typically made from hydrolyzed animal tissue and added to lend flavor and increase the food’s palatability. The ingredient list concludes with the standard array of vitamins, minerals, and amino acids necessary to make each meal nutritionally complete and balanced. Overall, this food is high in protein, low in fat, and low in carbohydrates. The food has 22 calories per ounce or 66 calories in each 3-ounce can. Fish Broth, Skipjack Tuna, Mackerel, Potatoes, Sunflower Oil, Natural Flavors, Tricalcium Phosphate, Guar Gum, Potassium Chloride, Choline Chloride, Taurine, Iron Proteinate, Zinc Proteinate, Niacin, Vitamin E Supplement, Thiamine Mononitrate, Vitamin B12 Supplement Manganese Proteinate, Copper Proteinate, Vitamin A Supplement, Calcium Pantothenate, Riboflavin Supplement, Pyridoxine Hydrochloride, Sodium Selenite, Biotin, Vitamin D3 Supplement, Folic Acid, Menadione Sodium Bisulfite Complex (Source of Vitamin K), Potassium Iodide. Turkey meal and chicken meal appear to be the primary protein sources in this dry cat food. Earthborn Holistic’s popular grain-free dry food is a meat-rich product that nixes the usual corn, soy, and wheat in favor of more on-trend peas, pea starch, and pea protein. But is it better than the average dry food? Let’s take a closer look at the ingredient list. The first ingredient is turkey meal, which is turkey with water and fat removed. It’s a concentrated source of animal protein. Turkey meal is followed by another protein concentrate—chicken meal. After these meat ingredients, the food contains peas and a few pea derivatives, including pea starch, pea protein, and pea fiber. These ingredients help to bind the food while increasing its protein, fiber, and carbohydrate content. Chicken fat is the food’s primary fat source. It’s good to see an animal-sourced fat featured prominently on the ingredient list. Animal fat has a rich fatty acid profile appropriate for carnivores. Speaking of fatty acids, the food contains flaxseed. While flaxseed is a good source of omega-3s for people, cats require the fatty acids found in animal fat and can’t utilize the type found in flaxseed. The food contains dried eggs and a small amount of Pacific whiting meal as additional sources of animal protein. Before we reach a series of vitamins, minerals, and amino acids, the ingredient list features small amounts of apples, blueberries, cranberries, carrots, and spinach. Earthborn Holistic says these ingredients provide antioxidants and other nutrients to support a healthy immune system. Finally, the ingredient list includes a long series of vitamins, minerals, and amino acids. It concludes with probiotics to support digestive health and immune function. Overall, this is a meat-rich food with high protein content, moderate fat, and moderate carbohydrate content. Compared to other dry foods, it’s low in carbohydrates and plant ingredients. Each cup of the food contains 395 calories. Turkey Meal, Chicken Meal, Peas, Chicken Fat (Preserved with mixed Tocopherols), Pea Starch, Pea Protein, Flaxseed, Natural Flavors, Pea Fiber, Dried Eggs, Pacific Whiting Meal, Apples, Blueberries, Cranberries, Carrots, Spinach, Salt, Potassium Chloride, Choline Chloride, Taurine, L-Lysine, DL-Methionine, Calcium Sulfate, L-Carnitine, Beta Carotene, Vitamin A Supplement, Vitamin D3 Supplement, Vitamin E Supplement, Zinc Sulfate, Ferrous Sulfate, Niacin, Folic Acid, Biotin, Manganese Sulfate, Copper Sulfate, Calcium Pantothenate, Thiamine Mononitrate, Pyridoxine Hydrochloride, Riboflavin Supplement, L-Ascorbyl-2-Polyphosphate (Source of Vitamin C), Zinc Proteinate, Manganese Proteinate, Copper Proteinate, Calcium Iodate, Sodium Selenite, Vitamin B12 Supplement, Yucca Schidigera Extract, Rosemary Extract, Dried Enterococcus Faecium Fermentation Product, Dried Lactobacillus Casei Fermentation Product, Dried Lactobacillus Acidophilus Fermentation Product. What do customers think of Earthborn cat food? Most Earthborn cat food listings receive positive customer reviews, earning primarily four and five-star reviews. Most complaints are related to the food’s palatability. Some cats just don’t like the way Earthborn Holistic foods taste and a few long-time customers complain that several formulas aren’t as good as they once were. How much does Earthborn cat food cost? Earthborn Holistic is priced similarly to other brands marketed as natural, holistic, or organic. Based on the company’s feeding guidelines for the average 10-lb cat, Earthborn Holistic wet cat food would cost about $3.87 per day. Earthborn Holistic dry food would cost closer to $0.35 per day. Overall, is Earthborn a good choice? 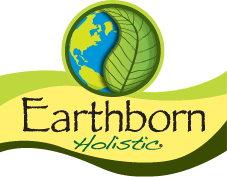 Earthborn Holistic is one of the most trustworthy brands on the market. Their parent company has been making pet food for over 70 years without issuing a single recall. Their products receive largely positive reviews and most customers say their cats love it. Their dry foods are made without a slurry of by-products and tend to have low carbohydrate content compared to other brands. Their wet food is less impressive. Most of their wet recipes are high in carbohydrates compared to other foods, particularly those at the same price point. Earthborn Holistic foods don’t live up to the most stringent carnivorous standards, but they have an uncontested reputation for superior quality control and safety. Where is Earthborn cat food sold? Earthborn Holistic is sold in pet specialty retail stores and online. Online retailers include Heartypet, PetFlow, Chewy, and other stores that carry cat food. 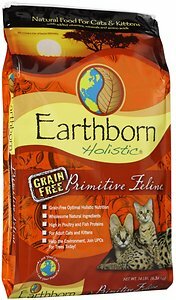 Click here to shop for Earthborn Holistic cat food on Chewy. It took me a long time to find a cat food that all my cats would eat and was at least healthier than average. I settled on Earthborn Holistic Chicken Catcciatori. I mixed that with homemade raw food quite awhile but now they just get the raw food and a small amount of dry food. Charles, it’s always good to learn about how you’ve developed a diet that works for both you and your cats. Thanks for chiming in!